This week some of us met our group of residents in the extra care home we’re working with. We wanted to talk to them about their experiences of being a part of the project so far and any ideas they had for the remaining 6 months of the project. We wanted to introduce our new tessellating tiles and 3D printed place markers too and ask them to take them away and see how they worked to stimulate stories over the period of a week. We’d also asked them to bring along any christmassy orientated objects to share with the group. Residents took turns to tell stories that helped to explain their different motivations and some unintended outcomes for them in the work we’ve been doing with them to remember and share stories. We were treated to tales of one resident’s address to a South Wales mining community debating society supporting gay rights, to another’s memories of his parents break up when he was very young. Motivations included wanting to leave stories for grandchildren and to record aspects of social and political history for prosperity. They also told us about unintended or unexpected outcomes such as becoming closer to each other, sharing moments of fun and laughter with these new friends and becoming closer to family members who they were able to share their memories with. One resident told us it had kept him awake at night thinking and reflecting on his past life! Before showing the group our new ‘objects’ one resident was keen to share some Christmassy objects with us. She had bought along a hand written recipe book from her school days in which she had her Christmas cake recipe. The well thumbed pages themselves, covered in marzipan marks and evoking memories of school days and family life were placed on the table and discussed by the group. She also had a tin from which she drew cake decorations. She told us that one year she had stopped using the hunters on the Christmas cake as her son disliked hunting and reflected on her ‘hoarding’ instincts and the problems of storage when moving into smaller flats or care home rooms. 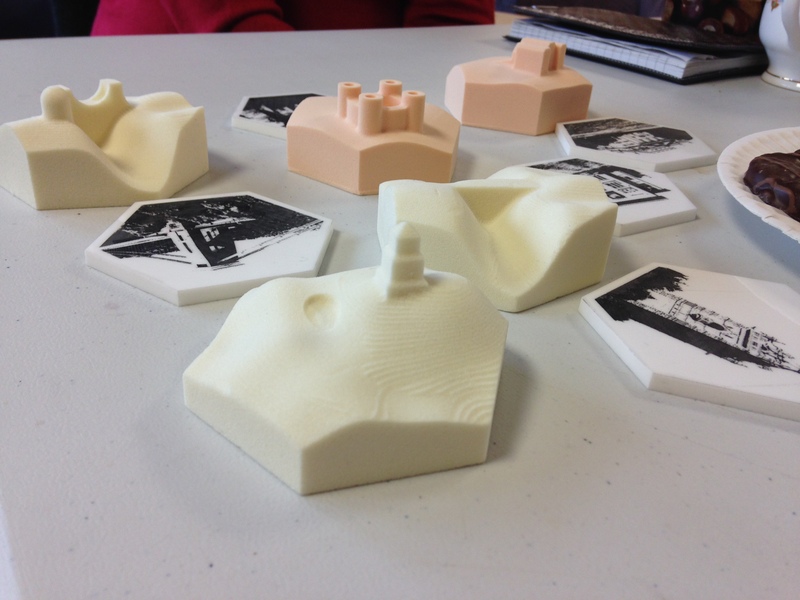 We then introduced our prototype proxy objects (see below) – a set of tessellating tiles and proxy objects designed as a result of several place based sessions and experiences with residents. Mixed reactions, especially when we tried to explain the use of RfiD tags to embed stories into the objects but all agreed to take an object and corresponding tile away with them. Looking forward to seeing whether they use them during the week and how effective they were in sparking story sharing with others.